Carrick Rangers manager Aaron Callaghan is looking beyond traditional methods in a bid to help the club beat the drop. Rangers welcome Coleraine to town on Saturday aiming to enhance a 10-point league lead over basement side Portadown and extend an unbeaten run to three games. A League Cup quarter-final success last week over Dungannon Swifts has set up a last-four test against Glenavon on Tuesday, December 13. 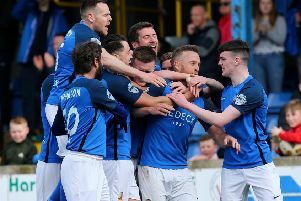 However, Danske Bank Premiership points remain the focus for Callaghan at present and he is using every resource available to cement Carrick’s top-flight status. “Fitness levels have been poor and in order to compete at this level you need the players to be in tip-top shape,” said Callaghan. “In order to do that we need to make sure our intensity is good on a Tuesday and Thursday. “We lost out on a week of fitness due to the midweek game but we are into the semi-final of a cup and will deal with that when it comes around. “All-in-all it has been a good week, into the semi-final of a cup and a good point. “There was a quick turnover between games on Wednesday and Saturday as Portadown didn’t play during the week but we did, so there was a concern over that coming in. “Ideally, we would have been able to get our ice baths and cool downs after the midweek cup match but we had to do that on Thursday but then couldn’t do the training on the Friday so close to the game. “Coleraine are in a good patch of form and score a good few goals.